"We welcome the dialogue between the leaders of the United States and North Korea that took place today in Singapore. This meeting was an important step toward advancing peace and stability on the Korean Peninsula," Chrystia Freeland said. 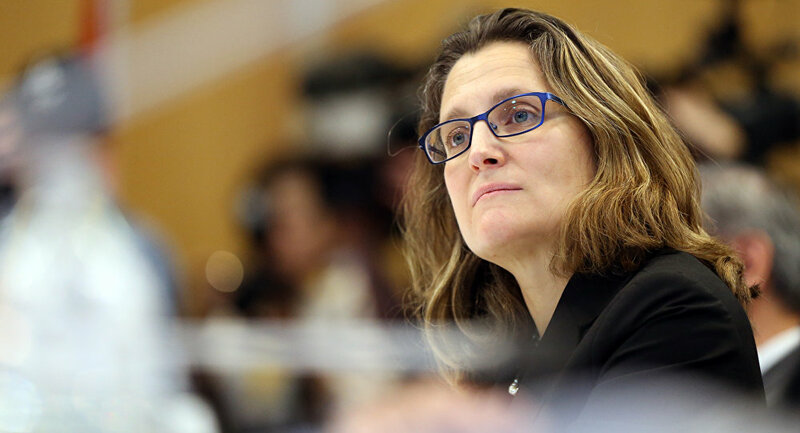 Freeland said Canada supports continued dialogue that leads to the complete, verifiable and irreversible denuclearization of North Korea. — Rosa Hwang (@journorosa) 12 июня 2018 г. The sanctions imposed by the global community against Pyongyang must remain in place until North Korea changes its action, Freeland added. The Canadian top diplomat also said she looks forward to seeing Kim following through on the commitments he made during the historic summit. Earlier on June 12, Trump and Kim held a historic summit in Singapore and committed the United States and North Korea to establishing new bilateral relations and building a lasting peace on the Korean peninsula. Moreover, Pyongyang affirmed its commitment to denuclearize in exchange for security guarantees from Washington.